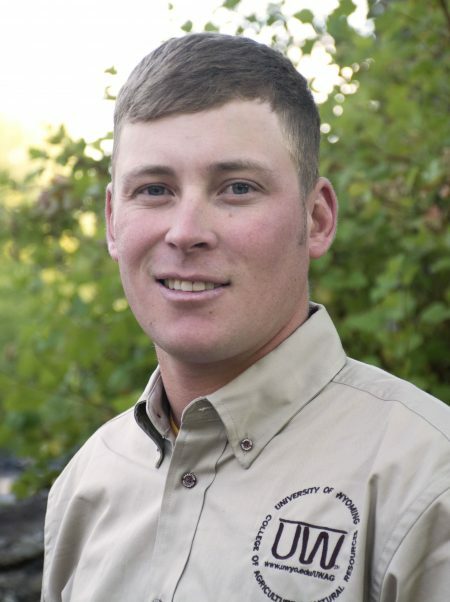 My name is Wes Taylor and I am excited to be one of the new Ag Ambassadors! I became passionate about the world of ag through FFA in high school. In that, I competed in agronomy, ag business, and vet science. I even went on to compete at the national level in the first two! My love for agriculture followed me out of high school, and I am now a member of Alpha Gamma Rho (the agricultural fraternity) and Alpha Tau Alpha (the agricultural education fraternity). My goal is to graduate with my bachelor’s and become an ag loan officer for a credit service; I want to eventually return to school to become a graduate student in some agricultural discipline. I cannot wait to see what the College of Agriculture and Ag Ambassadors has in store for me! Hey there! 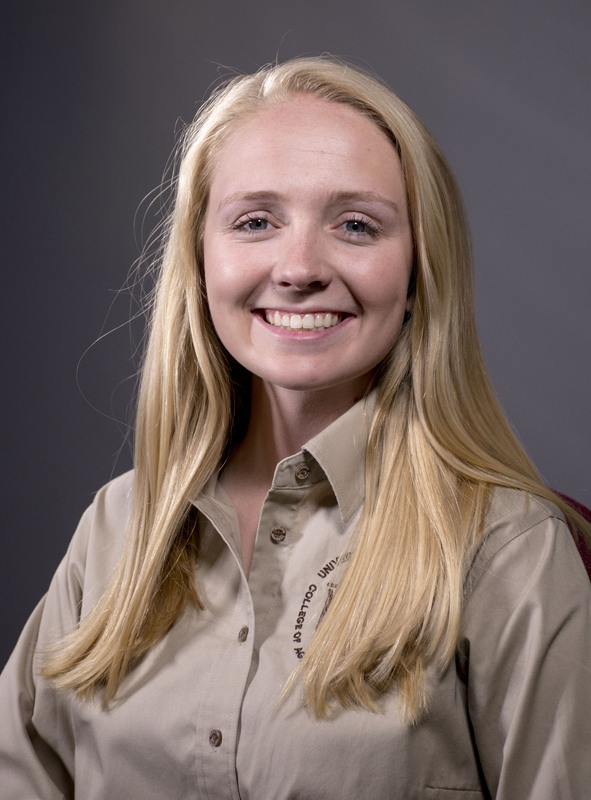 My name is Clara Delahaye, and as a first-year Ag Ambassador, I am really excited to see where this opportunity takes me! I am currently a sophomore here at the University of Wyoming studying Animal and Veterinary Science with minors in Honors and French. 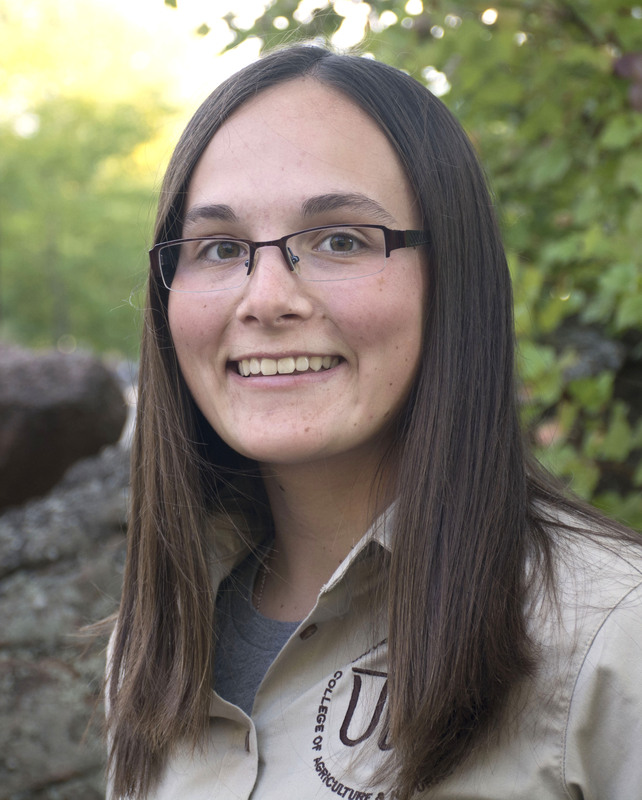 Born and raised in Wyoming, I was very involved with 4-H for nine years which sparked my interest in agricultural and now drives my passion for veterinary medicine. I am an officer in the Best Buddies RSO on campus as well as an active member of the Pre-veterinary club and Collegiate 4-H club. I have also recently joined Dr. Mark Gomelsky’s molecular biology research lab. Through this project, I will be engineering immune cells whose gene expression can be controlled by light to achieve localized immune suppression. I am so fortunate to be a part of the UW College of Ag and it has been amazing to have such incredible access to a wide variety of opportunities that can be tailored to specific interests. Outside of school, I enjoy spending time with family and friends hiking, backpacking, camping, skiing, biking, or playing basketball. Hi everyone, my name is Lauren Hladik and I am a junior at the University of Wyoming studying Animal Science with an Equine focus. I developed a passion for agriculture and the western way of life while growing up on my family ranch in Kittredge, Colorado, where we board horses. Having competed in rodeo, 4-H, and being involved with my local rodeo association, I am honored to be able to continue my involvement in agriculture by representing the College of Agriculture and Natural Resources. Upon graduating, I hope to return to the family ranch and establish a therapeutic riding center, with a certification in equine massage therapy and acupressure. 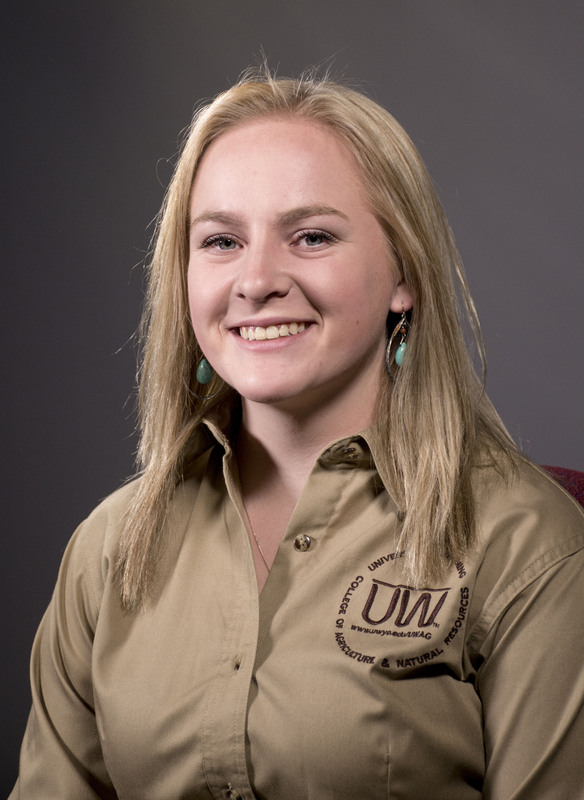 In addition to being an Ag Ambassador, I am a member of the Wyoming Collegiate Cattle Association and spent two years as a member of the UW Rodeo Team. In my free time, I enjoy barrel racing, ranch sorting, hunting, and playing with my dog. I am excited to further my education here at UW, and can’t wait to see the opportunities the College of Ag has for me in my future of representing agriculture! Hey there, my name is Bree Thompson and I am a junior at the University of Wyoming! I am majoring in Ag Business with a concentration in International Agriculture. I also plan to minor in Marketing. I grew up in Hot Springs, South Dakota, but I spent most of my weekends in Bowman, North Dakota, on my grandparent’s farm. I have been blessed to be able to run my own cattle on their land and partake on the decisions and operations on the farm, whether it be with the cattle or the fields. Having this strong agricultural background led me to the College of Ag, but not without some detours, however, I am beyond grateful I ended up where I did! I am excited to be a part of Ag Ambassadors and cannot wait for this chance to promote the College of Agriculture and Natural Resources! Hello, my name is Meagan Soehn. Currently I am a junior at the University of Wyoming with a major in Microbiology on a Pre-Veterinary track and a minor in Honors. Along with Ag Ambassadors I serve as the Vice-President for the Pre-Veterinary Club and am a member of the Mortar Board honor society. Outside of coursework and RSO’s I am employed by the Wyoming State Veterinary Lab. I work in a research lab headed by Dr. Brant Schumaker that is currently looking into new diagnostic assays for Brucellosis. Attending the University of Wyoming has truly been a blessing in many ways. The plethora of scholarships have allowed me to save money that I will need if I get into veterinary school. 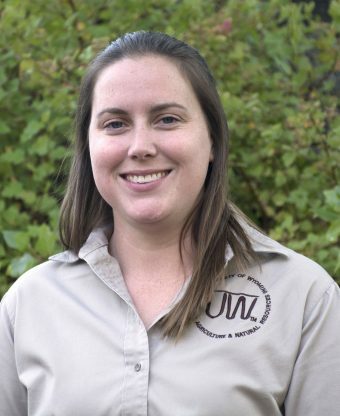 Through the RSO’s and my job I have also made connections within the veterinary field that has only strengthened my passion for this career. This past summer I was even able to spend two weeks in Uganda working with my lab. These have been life changing opportunities that I don’t that I could have received attending another university. My name is Jordan Williams and I am a Sophomore here at the University of Wyoming. I am from Telluride, CO and I am currently working on my degree in Agriculture Business- Livestock Business Management with a minor in Animal Science. Along with Ag Ambassadors, I am also involved in Wyoming Collegiate Cattle Association. I grew up on a ranch in Bedrock, CO raising around 400 head of beef cattle and have a true love for the agriculture industry. After my undergrad I am planning on law school, but only time will tell what life has in store! Howdy! My name is Madison Clark and I am a senior majoring in Agricultural Communications with minors in journalism, history, and horticulture. I am originally from Wellfleet, Nebraska, where I grew up competing in the sport of rodeo and being active in agriculture through FFA. Upon graduating I am planning on staying in school for a while longer to obtain a masters degree in Communications with a mass media emphasis. I hope to use my degrees to better communicate about agriculture whether it be through writing, broadcasting, research, or teaching. I am so grateful for the opportunities and experience that the University of Wyoming and the College of Ag and Natural Resources have provided for me to grow and learn as an individual and as a representative for the agriculture industry! Hi there! My name is Kristy DeGering. I’m Wyoming born and raised. I’m from a cattle ranch north of Lusk, Wyoming. My brother and I are the fifth generations on our family ranch. 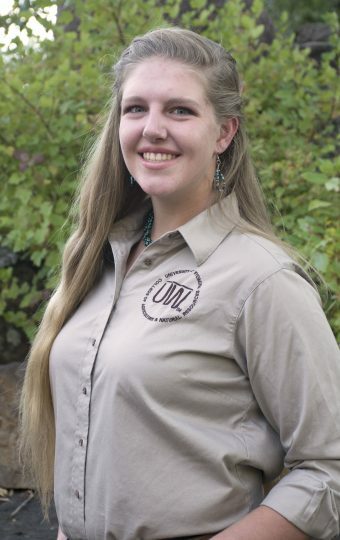 I graduated in May 2018 from the University of Wyoming with my degree in Agriculture Communications with minors in Farm and Ranch Management, Agriculture Business, and Public Relations. I decided to return to UW and am currently working toward my second bachelor's degree. This time in Agriculture Business. 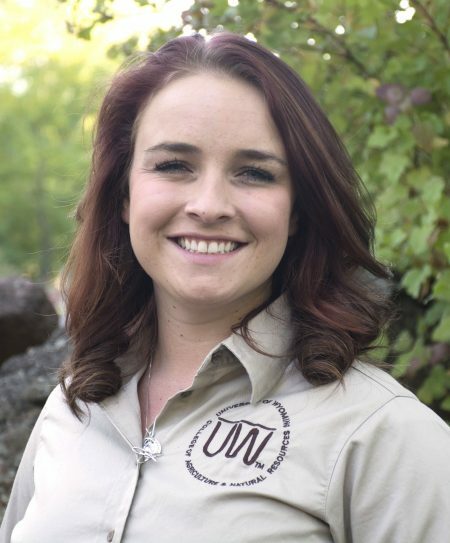 I am an active member of the Wyoming Collegiate Cattle Association, an Alumni of Sigma Alpha, the professional agriculture sorority, and my personal favorite an Ag Ambassador. A couple of fun facts about me are I love photography and being a dog mom to my Mini Aussie named Paisley. Hello! 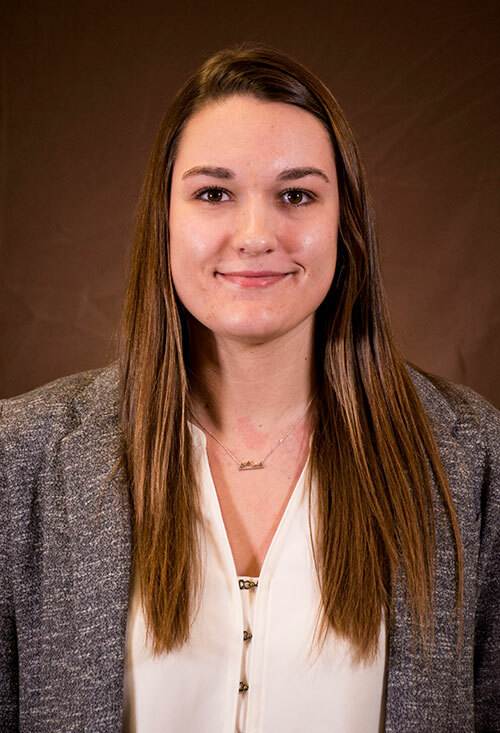 My name is Lexie Dockery, and I am a Junior here at the University of Wyoming. This is my second year as an Ag Ambassador and I couldn’t be more excited to continue this opportunity! My major is in AgBusiness with my concentration also in AgBusiness, I am minoring in Finance and Farm and Ranch Management as well. I grew up on a cattle ranch in Niobrara County, Wyoming and have always loved agriculture and the outdoors. I love going camping, fishing, and hiking with my family and friends! After graduation, I hope to work in a bank in Wyoming specializing in Ag-Lending. Hey! My name is Laura Fereday. This is my first year as an Ag ambassador. I am studying Ag Business here at the University of Wyoming and I love it! I grew up in a farming and ranching community in Utah before I moved to Estes Park, Colorado, where there is no Ag, that was a huge culture shock to me, which really made me see the importance of it. I grew up around horses and have competed on them since I was 6 years old from paints to hunter jumpers. I am the treasurer on the Equestrian Team and find myself at the barn with my 2 horses all of the time. Laramie is a great place to live, especially because there is something for everyone. I love this town and this school! The classes that I have taken are all applicable and really help further my knowledge. All in all its a great place to be with great people. 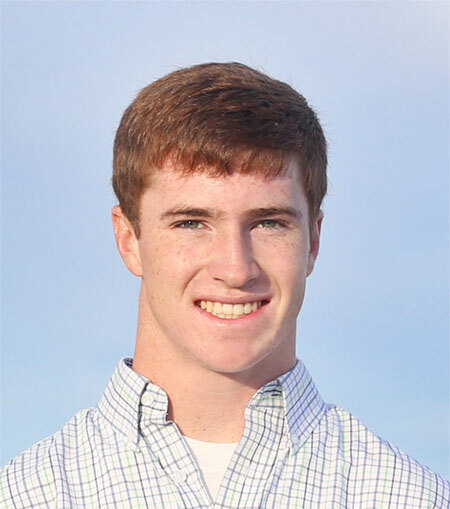 My name is Blake Ferris, and I am currently a sophomore at the University of Wyoming. I am studying Animal Science with a minor in Ag Business, a combination that provides an optimal balance for me. Originally, I am from Wiggins, Colorado where I grew up on my family’s cattle ranch. After I graduate from UW, I plan on returning to the family operation where I will continue my family’s ranching heritage. Given my interest in production agriculture, I am a member of the Wyoming Collegiate Cattle Association, Block and Bridle, and the Ag Ambassadors. All of these clubs, combined with my school work, have provided me a tremendous opportunity to learn and expand my horizons during my time here. I have thoroughly enjoyed UW so far, and I am looking forward to the next couple years in Laramie. Hi, everyone! 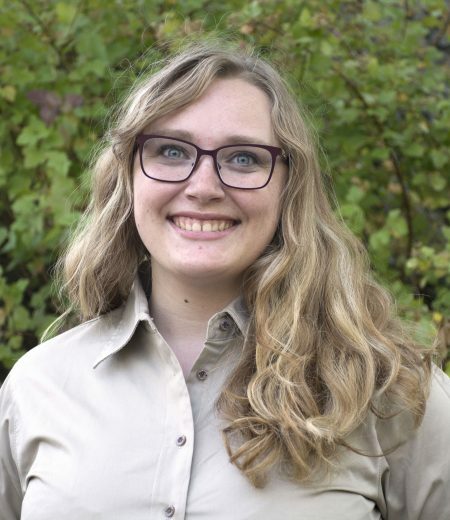 My name is Abby Gettinger, and I’m a senior studying Rangeland Ecology and Watershed Management with minors in Wildlife and Fisheries Biology and Management and Soil Science. I’m a Christian who loves just about anything in the outdoors! From hiking to horseback riding, being in the outdoors is like coming home to me. I chose the College of Agriculture and Natural Resources because I was impressed with the down-to-earth, personable attitude of the professors. After seeing the broad range of major and minor options that the College of Agriculture and Natural Resources offered, I felt excited about going to college for the first time. I love that Rangeland Ecology and Watershed Management allows me to pursue my passion for the outdoors through learning about good stewardship of natural resources. I also enjoy that my degree allows me to connect with people over things which individuals from all backgrounds can value: healthy, productive land, clean water, and space in which to enjoy yourself. I never knew that I could enjoy working so much! I am excited and honored to serve as an Ag Ambassador, especially since I believe that pursuing a major in this college is both rewarding and worthwhile. 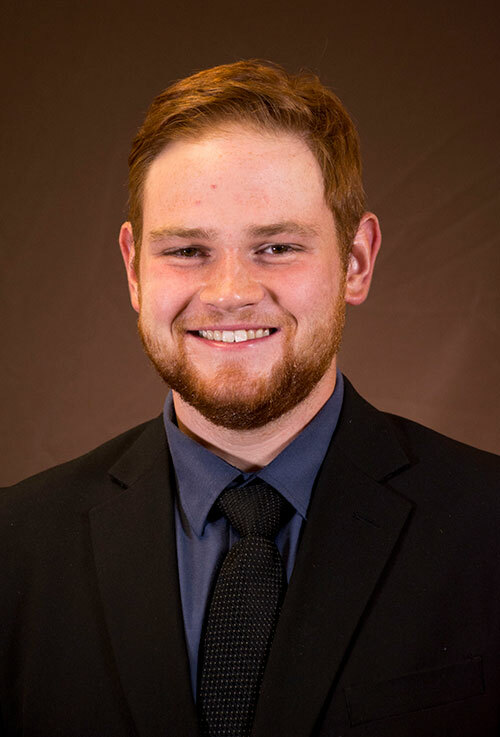 My name is Lane Hageman and I am a senior at the University of Wyoming, studying Agriculture Business. I am from Ft. Laramie Wyoming where I grew up on a ranch. We run approximately 900 cows, put up around 300 acres of hay, and have approximately 60 head of horses. I graduated from Lingle- Ft. Laramie high school in 2014. My interests include working on the ranch, riding colts, rodeoing, hunting and fishing, and leatherwork. I have been on the University of Wyoming rodeo team the last three years. I plan to receive my bachelor’s degree and return the family ranch, eventually taking it over. I will be the third generation of operate it. I really enjoy being involved in Agriculture and fully understand the importance of it. Throughout my life my goals are to learn more about agriculture, promote it, and protect it. I believe it is the backbone of this country. Hello! My name is Lacey Hill and this is my first year as an Ag ambassador. I am originally from Sacramento, Ca which is pretty different from Wyoming. 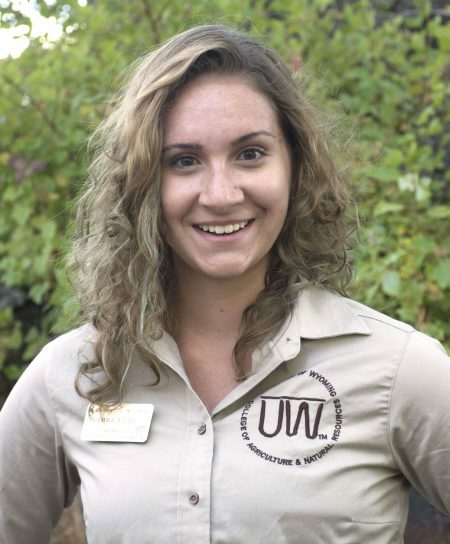 I am a Junior here at UW and am dual majoring in Animal Science with a concentration in Animal Biology and also majoring in Physiology. Because of my passion for nutrition and science, I plan on applying to medical school to continue my education. In addition to being busy taking those awesome Organic Chemistry classes, I work in the Metabolism lab in the Animal Science building which is pretty awesome. Working in the lab gives me a closer relationship with some of the faculty at UW and give me hands on experiences which I can’t find elsewhere such as putting my hand in a cow’s rumen aka its stomach! It is pretty cool. When I’m not working in the lab, I enjoy showing livestock, reading, volunteering for events run by the College of Ag as well as showing my passions for agriculture through Ag Ambassadors. Hey! My name is Shelby Hodges. I am from Worland, WY. As a junior at the University of Wyoming, I am pursuing a degree in Design, Merchandising, and Textiles from the Family and Consumer Science Department. I have a passion for design and creativity that I love being able to apply to my classes and my future career! Along with being an Ag Ambassador, I am the Vice President of the American Association of Family and Consumer Sciences RSO and a member of PHI Upsilon Omicron. Outside of class I enjoy running, hiking, and traveling. The College of Agriculture has helped me to widen my skill set and understanding of my field through many opportunities both inside and outside of the classroom. I am excited to take these experiences and use them to develop my career in the future! Hello! 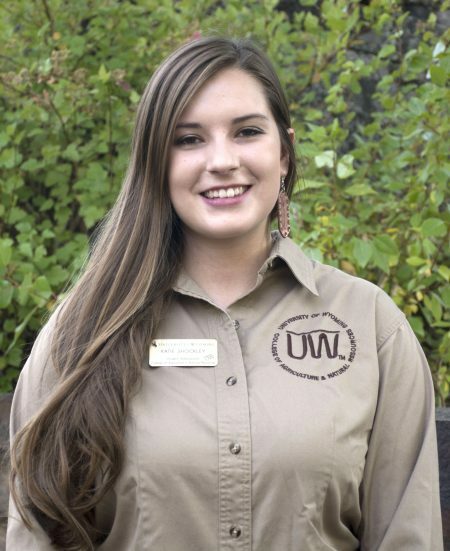 I’m Emma Rovani, and I’m a Laramie native in my junior year at UW. 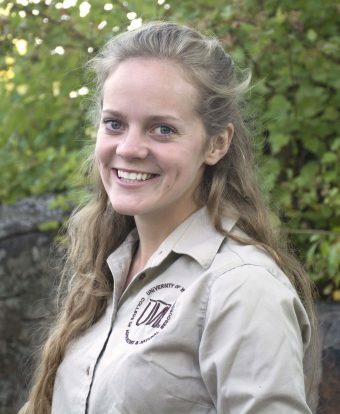 As a Microbiology major on a pre-veterinary track with a minor in Fisheries and Wildlife Biology and Management, you can find me active on campus in the Wyoming Pre-Veterinary Club and a violinist in the University of Wyoming Symphony Orchestra. Additionally, I have been lucky enough to have been employed by the Wyoming State Veterinary Laboratory since my freshman year—initially involved in Brucella ovis research, and more recently as a student employee in Necropsy/Trimming/Receiving and contributing to a study investigating disease/predation as factors contributing to Wyoming mule deer mortality. These hands-on experiences only affirmed my decision to attend UW, and are the reason I whole-heartedly recommend the COANR to anyone looking to take an active role in their own education. In my (rather limited) free time, I take full advantage of the outdoor opportunities around Laramie, and can be found skiing, hiking, biking, kayaking, or fishing. Hello! 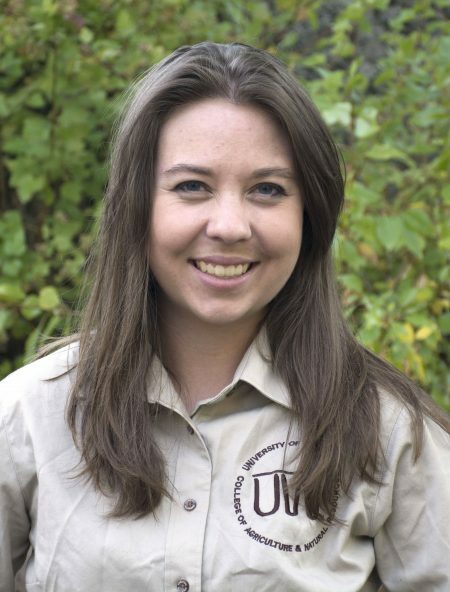 My name is Katie Shockley and I am currently a Junior here at the University of Wyoming. I am pursuing a double major in Agricultural Communications and Business Management with my concentration in Entrepreneurship. I am also minoring in Agriculture Business and Agriculture Economics. 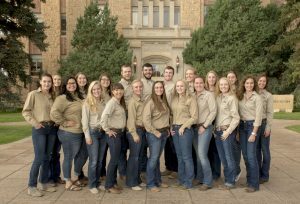 Along with Ag Ambassadors, I am a member of Wyoming Collegiate Cattle Association, Wyoming Stock Growers Association, Wyoming Honors Organization, and Alpha Kappa Psi. I am beyond thankful that I have had the opportunity to grow up on a farm/feedlot in Wheatland Wyoming, which allowed me to take an active and involved role in agriculture from a young age. I showed in 4-H and FFA and found a true passion for the agriculture industry. I am excited to be a College of Agriculture and Natural Resources Ambassador and look forward to promoting the college and agriculture industry. 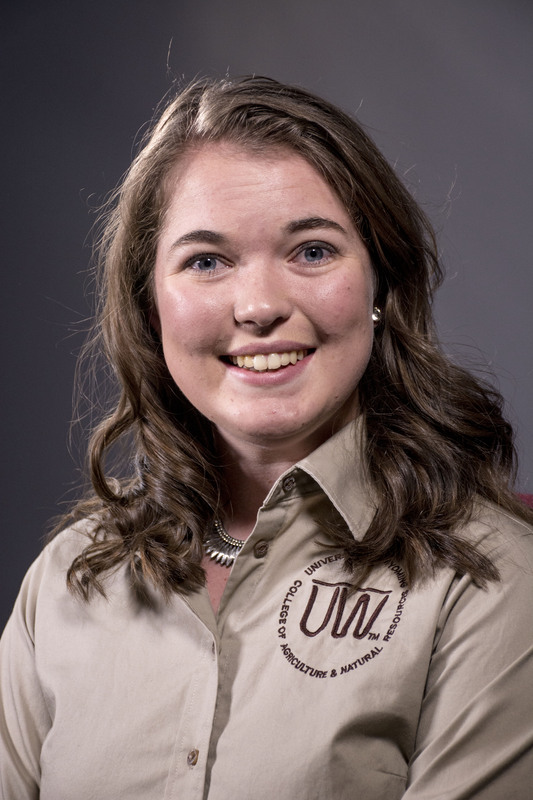 Hi, my name is Corinne Vaughan and I am a third year student majoring in Microbiology and Pre-Veterinary Science. I came to the University from Albuquerque, New Mexico, but I spent my time growing up all over the US as the proud daughter of an Air Force officer. I developed a love of animals from an early age and decided to return to my father’s alma mater to begin the process of becoming a Veterinarian. Aside from being an Ag Ambassador, I am also a member of the Pre-Vet club, Collegiate 4H, and the club tennis team in addition to working as a student necropsy technician at the Wyoming State Veterinary Laboratory. While at the University I have also had the opportunity to help with Brucellosis research currently being conducted in the Department of Veterinary Sciences, and to serve as a TA for General Microbiology. I love the role that I get to play as an advocate for agriculture and the sense of community that it brings to the already amazing experience that I have had at the university thus far. Hi there! 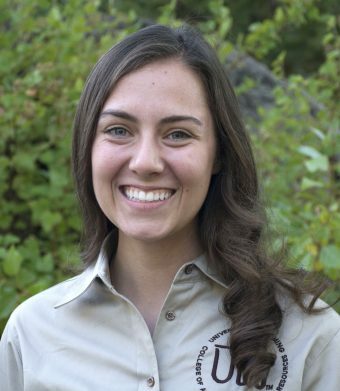 My name is Emily Violini, and I am a senior here at the University of Wyoming and a third year Ag Ambassador. I am studying Animal and Veterinary Science, with a concentration in Pre-Veterinary medicine. Additionally, I am minoring in Honors through the University Honors Program. Though I have fallen in love with Wyoming, I am originally from Salinas, California. I know what you’re thinking, “Why is she in Wyoming when she could be sitting on the beach somewhere?”. To be honest, when it’s really cold I sometimes ask myself the same question. Though it may be known for Hollywood and hippies eating kale, California has a large agricultural economy, and there’s a pretty good chance you may see a cowboy or farmer on the beach sometime. I grew up on my family’s cow/calf operation in Salinas, and was heavily involved in 4-H for 9 years. 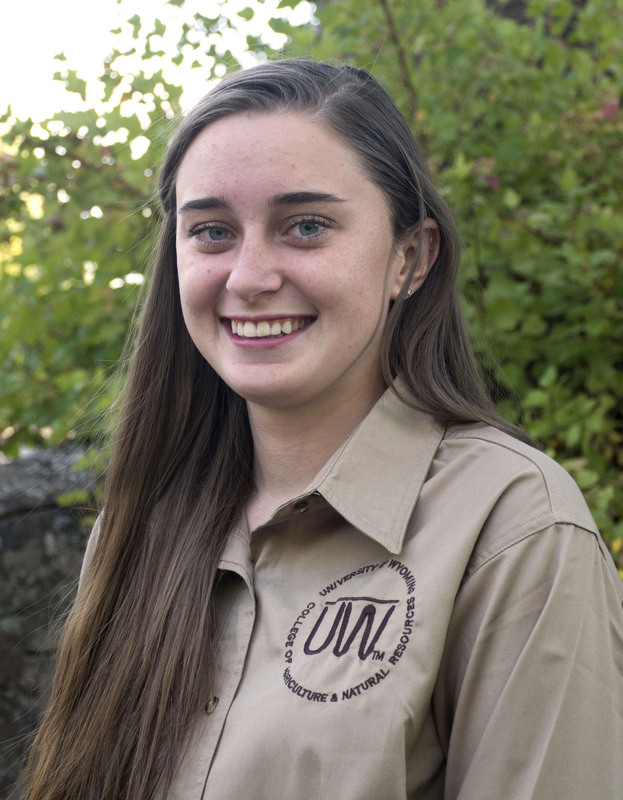 I am passionate about agricultural issues, particularly in the livestock industry, which is one of the reasons why I would like to go to veterinary school after graduating from UW to become a food animal veterinarian. I am an officer in the Wyoming Collegiate Cattle Association and the Collegiate 4-H club, two of the many awesome RSO’s you can join in the College of Ag and Natural Resources! I also work as a student necropsy technician at the Wyoming State Veterinary Laboratory, one of the amazing opportunities UW has that many other schools don’t! In my free time I enjoy spending time outdoors, reading, and drinking coffee. I love the experiences that the College of Ag has given me so far, and am excited to see what more is in store! My name is Jessica Windh and I am a graduate student in the department of Agricultural and Applied Economics. I graduated with my Bachelor’s in Rangeland Ecology and Watershed Management in December of 2016 from UW and I just couldn’t bring myself to leave! I am an active member of the Range Club and am the assistant coach for their URME (Undergraduate Range Management Exam) team. During my undergraduate education I helped with some research projects on how producers are affected by things like drought or predators, and that fueled my decision to go to grad school. My graduate project is and economic analysis of adaptive management via grazing rotations. 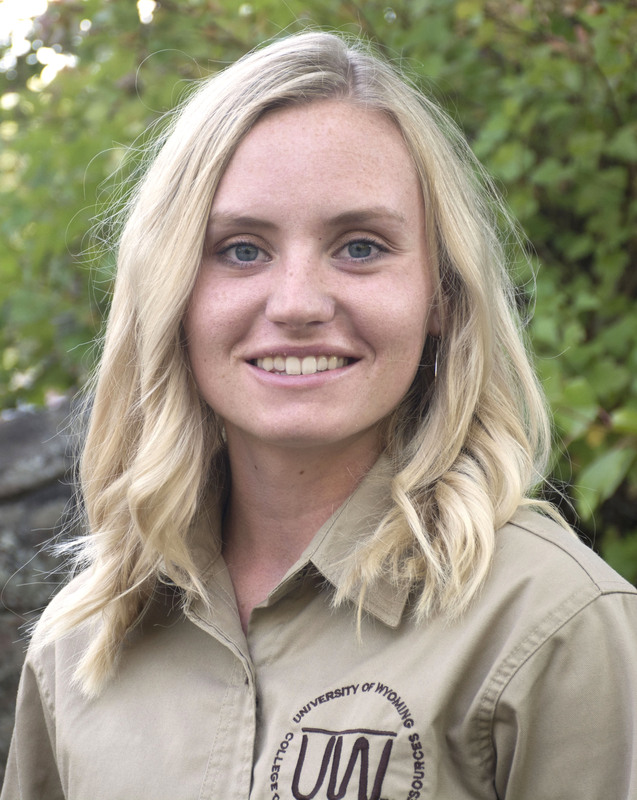 I am really excited to work on projects that have a direct impact on producers, and being an Ag Ambassador has really helped me become more connected with the Wyoming agriculture community. I grew up in the central valley of California where my family grows grapes and citrus, and transferred to UW from Fresno State in 2014. When I’m not at school or busy studying, I enjoy hanging out with friends, spending time with my dogs, and being outdoors! Upon graduation I hope to work for an agricultural extension service in the intermountain west region so that I can help producers find solutions to their problems. I am proud to be an Ag Ambassador for the College of Ag because I believe it is important for everyone to realize how important agriculture is to our society and how our students are going to help shape the future!